Are you sick of hearing me blather on about my new-to-me car yet? I hope not, because have I got stories to tell! I can't get over how much I'm enjoying driving Little Red. People just seem friendlier when you're driving a Beetle. Other Beetle drivers toot a friendly hello when they pass by, neighbors & strangers out on the road throw up their hands in friendly waves and people strike up conversations in parking lots. Someone even offered to pay for my tank of gas. Well, actually that guy wanted to pay for mine if I'd pay for his. He was driving a giant, gas-guzzling, double tanked pickup truck so I declined his offer, but never the less, he was very friendly. 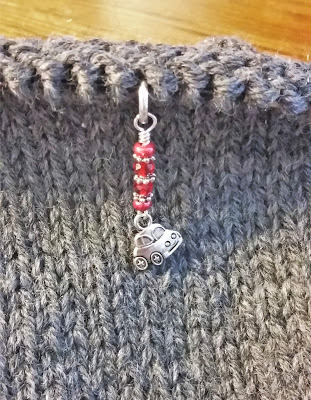 VW Beetle stitch markers! I found them at Jill's Handmade Stuff. The listing was for blue beaded stitch markers which would never do. After all, a girl's knitting must coordinate with her car! I asked if the shop could make red ones, the answer was yes and a few days later.... My knitting coordinates with my car. 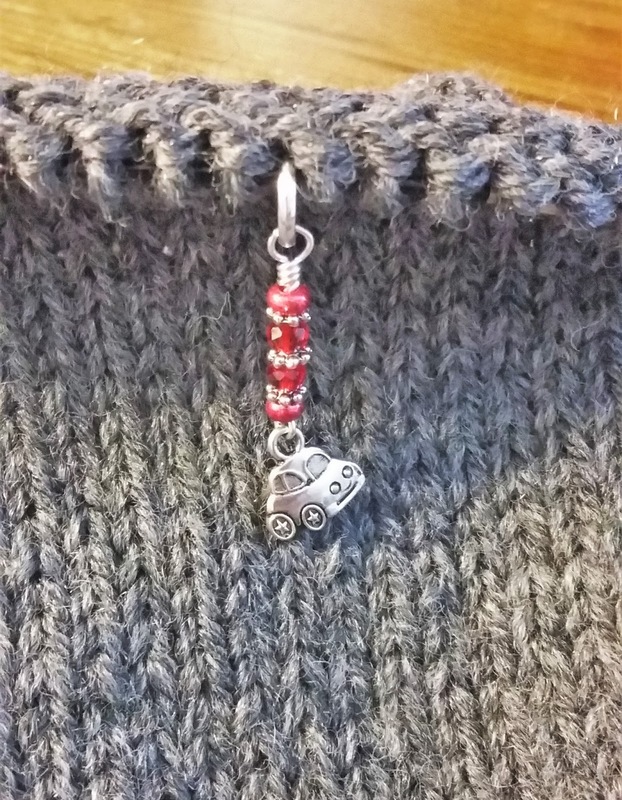 I can't express how much I love these stitch markers. Besides the VW Beetle one, the set contains eight more plain beaded markers. Of the eight, one is missing a silver spacer bead. I'm not sure if it's by accident or planned, but either way, it's great! It's barely noticeable unless you look for it, but it can used to indicate something special. And, besides matching my car, I can throw a green beaded stitch marker into the mix and be ready for Christmas knitting. I know.... Christmas. No one wants to hear about Christmas yet.... except, I've already eaten so much Candy Corn, I'm sort of done with fall and ready to move on to Christmas and candy canes. Anyway, if you're looking to spice up your stitch marker collection, go check out Jill's Handmade Stuff. She's got zillions of designs to choose from, her customer service was great and shipping was super fast. I'll definitely be shopping there again. To see what others are creating this week, join me over at Frontier Dreams' #CraftingOn link-up. Oh that is adorable- and why not match your car and your knitting!